Most common in East and South Estonia, as dewberries (Rubus caesius) are in West Estonia. 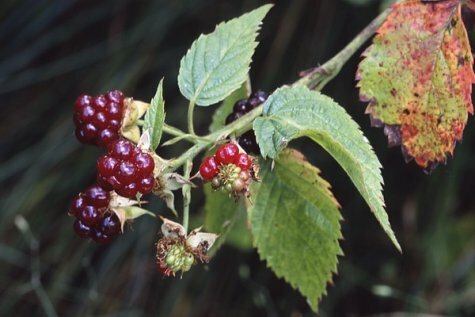 The biennial stems of the blackberry like those of the dewberry are upright when they grow under trees, and trail along the ground in open spaces. Now the fruits – botanically, aggregate fruits made up of drupelets, each containing a large seed – are ripe and coloured a glossy blackish brown. You can pick them for eating although they don’t offer any special taste sensation - but for a forest rambler they quench the thirst.